Arizona Sheriff Joe Arpaio is used to being in court. 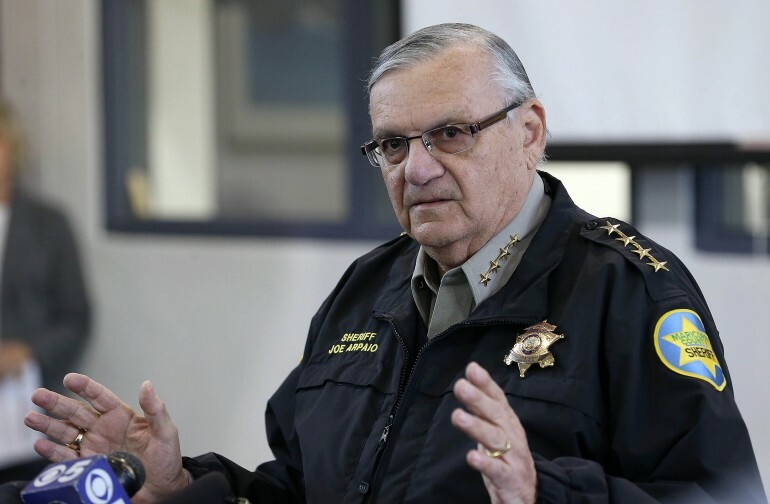 Usually, it’s to defend his Phoenix-area department against lawsuits, like those that sparked by inhumane treatment of prisoners in Arpaio’s tent cities, racial profiling of Latinos by deputies and humiliating videos of pretrial detainees. But Arpaio has also been in court recently as a plaintiff. In Arpaio vs. Obama , the Maricopa County Sheriff alleged that White House immigration policies giving deportation protection to immigrants directly harm the operations of law enforcement. On Friday, the D.C. District court of appeals ruled that Arpaio doesn’t have standing in the case, meaning that he can’t prove that a concrete injury was caused by Obama's policies. Arpaio’s lawsuit argued that more immigrants freed from deportation by Obama’s immigration programs DACA and DAPA would result in more crimes being committed in the Phoenix area, resulting in higher costs by the department. He also advanced a theory that deferred action would inspire more migrants to come to the country illegally, despite the fact that DAPA and DACA can’t be extended to immigrants who arrive after the program’s announcement. “His allegations that the policies will cause more crime in Maricopa County are unduly speculative. Projected increases he anticipates in the county’s policing burden and jail population rest on chains of supposition and contradict acknowledged realities,” Judge Pillard wrote in the majority opinion, quoted by the Washington Post . Joe Arpaio has a history of railing against “acknowledged realities.” In 2011, he added fire to the flames of the Obama birther conspiracy by convening a group of volunteer detectives to investigate the President’s long-form birth certificate. The posse concluded that the birth certificate was a “forgery.” Arpaio reiterated those claims as recently as July 2015 in an interview with a Philadelphia radio station. He also voiced his support for fellow birther and anti-immigration megaphone Donald Trump, telling radio host Aaron Klein that companies who dumped the mogul following his comments that Mexican immigrants were “rapists” and criminals” had impinged on Trump’s right to freedom of speech. He wondered why Trump had stopped speaking about Obama’s birth certificate. "You know I've been working on [the birth certificate issue]. So I don't know. I guess you got to be politically correct when you run for office," Arpaio said . Arpaio lawyer Larry Klayman said that he is confident that he will win the immigration case on appeal. "We are confident the Supreme Court will agree with Sheriff Arpaio that he has standing and that the executive actions of President Obama are unconstitutional," he told CNN . Arpaio’s lawsuit is expected to advance to the 5th Circuit Court, which is also considering a separate lawsuit against Obama’s immigration policies. In that case, the state of Texas has been granted standing not by saying that immigrants will commit crime, but by arguing that immigrants who follow the law will cost the government more money. For example, Texas states that it will have to spend more money on services like driver’s licenses. That decision is being appealed. The White House argues that both lawsuits should be dismissed. “We are pleased that the D.C. Circuit did not allow Sheriff Arpaio's lawsuit to stand in the way of commonsense measures to advance public safety and bring greater accountability to our immigration system [....] We will continue to work toward resolving the legal challenges so that the Administration can move forward with implementing all of the President's commonsense immigration policies,” Deputy Press Secretary Eric Schultz said in a statement.